Military vehicles are complex machines that require clear vision. An instant overview that allows the operation to progress smoothly and safely. Especially when the vehicles are maneuvering in small alleys and crowded environments. Drivers have minimal vision around the vehicle, and that is why it is essential to solve large blind spots in a professional manner. This is where Orlaco’s camera monitor solutions could help to improve your operational ef ciency and safety. together with our iR nightView cameras and illumination, the driver can analyze the overall situation and operate the vehicle faster and more ef ciently. As a Dutch Manufacturer Orlaco is also your offset partner. We understand that military vehicle drivers are required to take in what is happening around the vehicle at all times. Vehicles which mostly have very small windows and any number of blind spots. the driver has to turn their body this way and that to get a relative overview the situation, possibly leading to short or even long term ergonomic injuries. By viewing the orlaco monitor located on the dashboard, the driver can maintain correct posture and work more comfortably. the driver then feels more safe, secure and in control of the vehicle, which could reduce stress and provide comfort. The frontview camera provides the required visibility at the front of the truck. A quick look at the monitor and you will know whether you can drive off safely without overlooking a cyclist, pedestrian or object. The rearview camera lets you see the area immediately behind the truck. the monitor in the cab automatically switches over to this camera if you select reverse gear, allowing you to reverse safely. Blind spots are a thing of the past thanks to surround view. 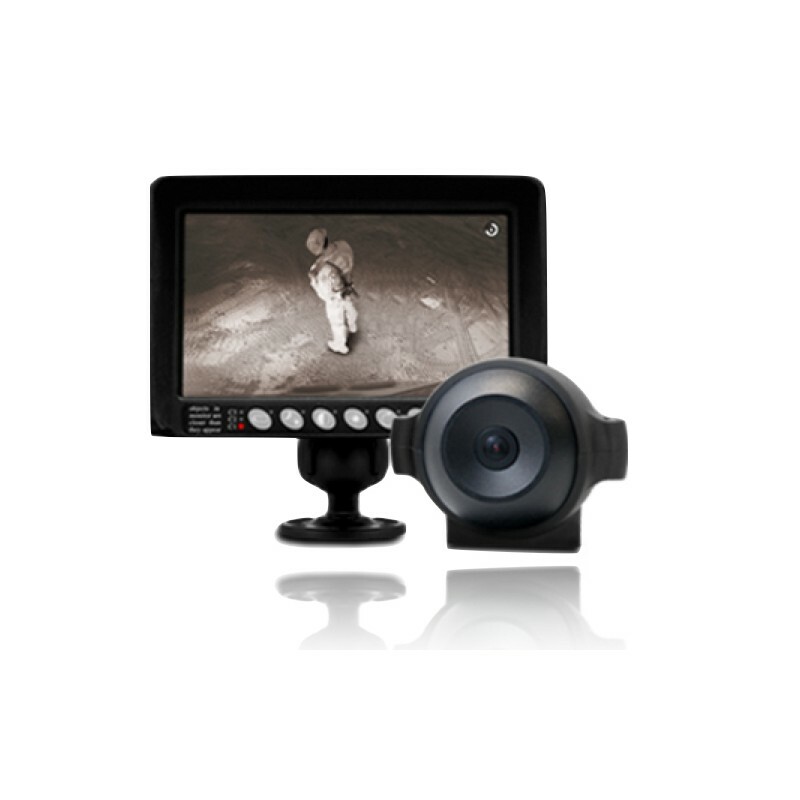 Surround view offers 360 degrees visibility around a vehicle. When manoeuvring through narrow streets or busy areas, surround view gives the driver maximum visibility on all sides of the truck via a single, central monitor. Because the camera images overlap, the driver is able to see every person and object around his vehicle. In infrared blackout situations orlaco cameras (AMos iR lED) will still give a perfect image. With the same color camera and with 850nm illumination you still can reverse safely. APCs are increasingly being used for short Direct Action and short-duration strikes. the crew must be prepared for anything, and be aware of the environment and situation outside the ve- hicle. therefore, cameras and displays are mounted throughout the cabin, to give the crew an all-round view. During emergencies it is vital to have proper vision on the situation. The Riot View provides a broad eld of vision. the integrated led light enables vision up to 25m ahead without blinding bystanders. The zoomcam has a 480x zoom function, which ena- bles proper facial recognition. this zoom consists of 40x optical zoom and 12x digital zoom. the footage can be saved on an sD card. the footage can be live streamed via a cloud service, a must for taking correct decisions from a distance.